If the motor is designed to run in star a 380V 3-phase power supply, then it cannot be connected in delta on the 'same' supply. That would be the equivalent of applying 380 volt to 220v windings so clearly the motor would fail. Note that in star, each winding gets root3 of the applied voltage (or 380/1.732) connecting in delta means that each winding get the phase-phase voltage EG 380V. If the motor is rated at 380V - 'delta connected' then it could be connected in star or delta as connecting a 380V delta rated motor in star will reduce the voltage across the windings to 220V which is OK and often used in Star/Delta starting to reduce start up current. Of Couse all 6 motor windings must be accessible. As stated above, you can take a 380v, 3 phase star connected motor and run it as a 220v, three phase delta connected motor. Going back to basics it is the current driven by the voltage that creates the flux. The flux density (dependent on many things) is a function of the current and voltage. The current is controlled by the impedance of the circuit and the load on the motor. As most insulation that goes into motors is rated at 1000v plus, the voltage is not a problem until the impedance gets low enough to exceed the current limitation on the conductors to a point where the temperature will destroy the insulation. We have run 380v on 525v and vice versa in an emergency. The efficiency and power factor will NOT be as per design and you must understand this. Setting up the protection is tricky and safety first, please. In summary, you can put any voltage onto a motor as long as it does not exceed the insulation level and the current limitations of that particular motor. In closing, there are single phase inputs to three phase variable frequency drives (VFD). Very often I get a query that they cannot get the motor up to full load without exceeding the name plate data. Small motors, for which these VFDs where designed for are generally connected in star. As the VFD cannot generate a DC bus above the peak voltage of the input, you can never get 380v out of a 220v input. Thus the VFD gives out three phase 220v. The motor needs to be connected in delta to run at full load / power. Very helpful. I am confronted with a 380 V/220V 3p motor and only have a 240V single phase power supply. I will, it appears, need a variable frequency drive. I can only hope this works. Thanks! by chance I have a VFD requiring input 380V, 3 phase, however, I only have 240V single phase power supply and a 240V, 3 phase motor. Can I simply supply 240V single phase to the VFD and use it to run the motor? Please help me. We are supplying a machine in Gulf countries. The machine will travel in different countries in Gulf or middle east. So our client asked us to provide a machine which could run on both 220V and 380V supply. Currently we are using 3 Phase motor with delta connection, and VFD. 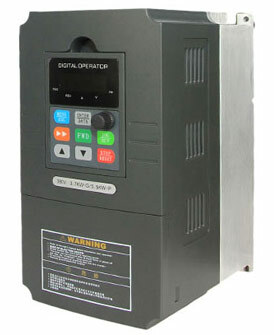 Here in India we are giving single phase power supply to the motor through VFD but small amount of current is there in the machine. What will be the solution and is the same connection suitable to run in gulf countries??. Hope you understand our problem. can we run 230V, 3 Phase motor with a star- delta starter ?